The draw event will take place on 27 April 2011 in Leek, Netherlands. The final tournament of the 2011 Women’s 19 European Championship will be carried out from 04 to 14 August 2011. Playing venues for handball players born 1992 and younger will be Amelo, Arnhem, Leek, Maastricht and Rotterdam. Five teams were already qualified prior to the qualification: Netherlands as organisers, Denmark, Russia, Norway and France after their places 1-4 at the 2009 Women’s 17 European Championships in Serbia. The composition of the pots is based on the ranking of the 2009 Women’s 17 European Championships in Serbia updated with the results of the qualification groups. The 16 qualified teams will be drawn into four groups with four teams each. The Netherlands as hosting nation will have the right to choose the group in which they would like to participate after the rows 4, 3 and 1 are determined. In step one the teams of Pot 4 are drawn to row 4. In step two the teams of Pot 3 are drawn to row 3. In step three the teams of Pot 1 are drawn to row 1. In step four the Netherlands as organisers have the right to choose their group. In step five the three remaining teams of Pot 2 are drawn to row 2. The draw of the four groups at the final tournament will take place on Wednesday, 27 April 2011 in Leek, Netherlands, at approximately 17:30 hrs (local time). 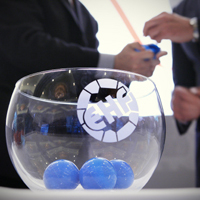 It is part of a combined event with the draw of the Women’s EHF EURO 2012. The entire draw event will be broadcast on a live web stream on the Official Website of the EHF EURO 2012, starting 16:45 hrs (local time).